Neukirchen is a village in the Pinzgau area of Salzburg. 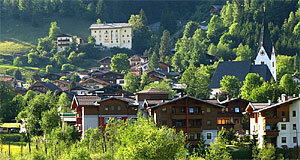 It is situated in the south of the region, just north of the central ridge of the Alps. Despite its name, Neukirchen is actually situated closer to Mount Wildkogel than to Mount Großvenediger. Alas, the latter is higher (3,674 metres, one of Austria′s highest mountains) and more famous. Neukirchen is a touristy place and has its own skiing area. The community has a total population of approximately 2,600. The local skiing area is located at the mount Wildkogel; it extends between altitudes of 860 and 2,250 metres. The central cable car is the Wildkogelbahn. In addition to skiing, other winter sports are being promoted. However, since Neukirchen is situated within the National Park Hohe Tauern, it is somewhat constrained in the extent to which skiing can be allowed. The Wildkogel skiing area has a total of approximately 55 kilometres of maintained slopes and offers other winter sport opportunities, too (snow hiking, tobogganing). The Wildkogelbahn is also operated during the summer months. At this time of the year, it is hiking that draws to crowds to Neukirchen. Like most municipalities in sparsely populated areas, Neukirchen is rather big in terms of territory: 165 square kilometres make Neukirchen the number four of all Pinzgau communities by this measure.